While houses on stilts can be quite common in Cambodia (you’ll often see people relaxing in hammocks strung underneath the houses, homes on stilts in a lake…well, that’s a bit more unusual. Kompong Phluk is a set of villages that are located on the floodplain of the Tonle Sap Lake, about 10 miles (16 km) from Siem Reap. The community, which consists of about 3,000 villagers, mostly live in stilted homes and depend on fishing and tourism for their livelihood. During wet season, this area will be completely submerged (hence the houses on stilts) and Kompong Phluk truly becomes a semi-floating village; in the dry season, the same stilted houses may rise up to 18 feet (about 6 meters) above the water. Also of interest is a mangrove forest that is also “flooded” during the rainy season, creating an atmospheric journey through the submerged fauna. Usually a trip through this area is part of the standard tour. While the scenery is gorgeous and visiting a stilt village is interesting, perhaps the best part of visiting Kompong Phluk is the opportunity to see a unique way of Cambodian life. Getting to Kampong Phluk sees fewer tourists than nearby Chong Khneas, so it might be worth the effort to get there. The best bet is to hire a tuk tuk or moto and then take a boat (during wet season only) from Roulos village. A round-trip to Kampon Phluk from Siem Reap will cost about $40 to $60. Combine local culture with ancient history on this private 2-day tour of Siem Reap. On day one, visit the UNESCO-listed Angkor Archaeological Park. The park boasts almost a thousand years of history, so a guided tour is a good way to focus on the highlights. During the second day, a guided visit to the floating villages of the Tonlé Sap provides an insight into a unique way of life in Cambodia. Stretching out across western Cambodia, the great lake of Tonle Sap looks particularly beautiful lit up by the setting sun. On this private tour to the lake, enjoy the view and get stunning photos of the lake at dusk without a large tour group to distract you or get in the way of your shots. While you’re there, visit the floating village of Kompong Phluk and experience the rhythms of commune life outside of the big city. Visit an isolated jungle temple and a floating village on a full-day, private tour from Siem Riep to Beng Mealea and Tonle Sap Lake. Travel by private vehicle as you explore ancient architecture, cruise the largest freshwater lake in Southeast Asia, and get a glimpse of life in a traditional fishing community. This full-day excursion includes all transport from Siem Riep in a private vehicle, entrance fees, and a sightseeing cruise on Tonle Sap Lake, with the personal experience of a private tour. Get a taste of rural Cambodia on this 5-hour tour from Siem Reap, including hotel pick-up. Cruise around the serene Tonle Sap Lake and keep your camera to hand as you glide through the flooded forest, admire the stilted houses of Kompong Phluk village and pass a scenic panorama of floating markets, fish farms and rice paddies. 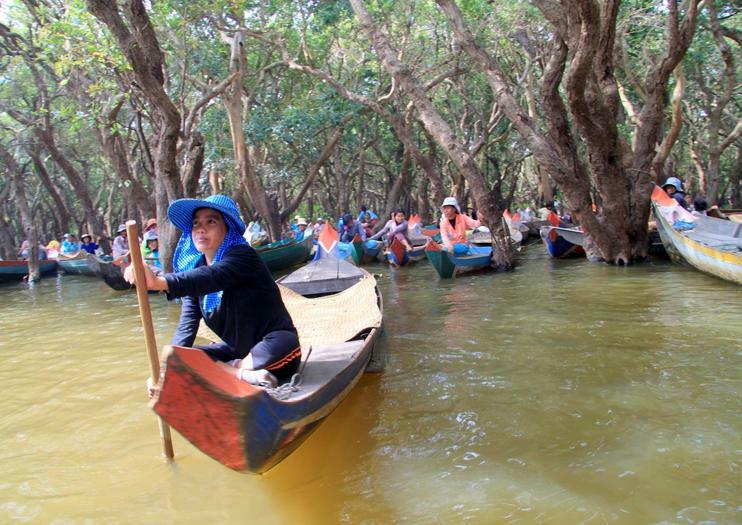 Experience traditional life in Cambodia on this half-day cruise from Siem Reap and visit the flooded forest and floating village of Kompong Phluk. Along the way, paddle past lush rice paddies, stilted houses, and floating markets; watch local fishermen at work; and admire the view across Tonle Sap Lake. Immerse yourself in ancient history and Cambodian culture on a private, 3-day tour of Angkor Archeological Park and Tonle Sap Lake. With two full days to explore the Angkor temples, you can see top destinations, then leave crowds behind at exquisite temples set outside the main site. After your time in Angkor, cruise Tonle Sap Lake to spot remarkable birds and see a traditional fishing village on stilts. Witness the magical sunset over Tonle Sap Lake on this romantic evening cruise from Siem Reap. First, head to the floating village of Kompong Phluk to enjoy a small boat cruise around the stilted houses, waterfront pagodas and flooded forests. Then, board a floating restaurant for a delicious buffet dinner (included) and enjoy unlimited cocktails as you watch the sunset over the lake. Set on Tonle Sap Lake and only 18 miles (30 km) from Siem Reap, Kompong Phluk village showcases the unique way in which Cambodian lakeside residents live their lives. This half-day tour offers an up-close view of the unique lifestyle and culture of the Tonle Sap population, including distinctive architecture, local trade, and exotic wildlife. No matter how much time you have in Cambodia, the UNESCO World Heritage-listed Angkor Archaeological Park is a must-see attraction. Enhance your experience of the Angkor temples, and explore at a more relaxed pace, on a private 2-day tour that ensures you receive undivided attention from your guide. Discover insider info that’s crucial to understanding the ancient structures and enjoy the convenience of hotel pickup and drop-off each day. Savor the perfect combo of ancient culture and rural life on this private door-to-door tour that’s ideal for photographers. First, discover Angkor’s majestic art at the pink-hued temple of Banteay Srei with your private guide. Next, enjoy a boat ride on the waters of Tonle Sap to the “floating village”, Kompong Phluk. Please note: admission to Banteay Srei is at your own expense. Spend half a day exploring the villages and floodplain waterways of Kompong Phluk with this half-day tour from Siem Reap. You'll learn about local history and culture as you explore floating villages via motorboat, and you'll even get the chance to go on a rowboat tour of a flooded mangrove (from October through January, for an additional fee). Immerse yourself in local life on this full-day tour of rural Cambodia from Siem Reap. Cruise along Tonle Sap Lake, stopping to explore the lively floating village of Chong Khneas along the way. Keep your camera to hand as you wind through the dramatic scenery of the flooded forest and admire the stilted houses of Kompong Phluk. Finally, tuck into a delicious buffet lunch (included) at the Tara floating restaurant, then sip a cocktail and relax in a hammock as you soak up the views. Visit two traditional villages in Tonle Sap Lake on a half-day tour from Siem Riep that explores the largest freshwater lake in Southeast Asia. You’ll see a true floating village and a community built on stilts, then travel through a watery mangrove forest, with a break for lunch and drinks on a 135-foot (41-mt.) lake boat. This full-day tour includes round-trip transport from Siem Riep hotels, lunch, and a sightseeing cruise by longtail boat. Gain in-depth knowledge of the UNESCO World Heritage Angkor Archeological Site and its surroundings with this three-day tour of the incredible temples, ruins, and local attractions. Along with the temples of Angkor, you'l get to explore the jungle temple of Beng Mealaea, the sandstone Banteay Srei Temple, and te floating villages in the Kampong Phluk area, with plenty of other stops along the way. We travel by a luxury air-conditioned vehicle on the main road. Enjoy taking boat trip around 2 hours for the whole tour to Kompong Phluk village, on Tonle Sap lake. Go to visit Kompong Phluk. Due to the increase in volume up to 10 times of the Tonle Sap Lake towards the end of the rainy season, all the fishing villages adjacent to it are built on stilts as high as 6-7 meters. Then take the opportunity to get a glimpse of the traditional way of life in Cambodia, learn about Cambodia culture and enjoy the accompany of friendly local villagers. Visit the picturesque rice fields and surroundings. As we meander along small tracks through the village on an ox cart one of our professional guides will explain about the way of life in the village and Cambodian Culture. Find out the life on floating village. Say goodbye to the Siem Reap hubbub and hello to the serenity of rural Cambodia on this door-to-door half-day tour that skips the self-drive hassles. Traveling with your private guide, explore Beng Mealea, a less-visited Angkor-era temple still covered in jungle. Next, discover the stilt houses of Kompong Phluk and cruise through the mangroves to capture sunset over the Tonlé Sap lake. Tour excludes entrance fees and boat tickets. This is the ideal tour for travelers interested in visiting Cambodia’s incredible temples. Save hours researching and organizing your itinerary by having everything planned out for you. A rough structure is designed for you, but you can set the pace of the tour. Sights you’ll visit include Beng Mealea, Kampong Phluk floating village, Tonle Sap Lake, Angkor Thom, Ta Prohm, Preah Khan, and Angkor Wat. All include - Travelers will enjoy the package and payment in one. Experience with local people in our homestay. This is 50 kilo meters biking tour.In the warm morning at 8:00, we bike to independence garden, Royal residence and the crowd of bets on the top of tree.Next, we bike to Angkor National museum for 1 hour and half . After that, we continue to small killing Field exhibitions and then we visit War Museum for 1 hour. We relax for lunch.Next place,we move to Artisan D Angkor and continue to Chreav Eco Tourism Community. After that, we head to Kompong Pluk floating village for 1 hour and continue to Chong Khneas floating village.Then,we take the bikes and ride to the hill .On the way, we stop for Lotus Farm for 20 minutes .Next, we climb up Kroum for uphill sunset.Lastly, we drive to hotel. Shun both the crowds and the transport touts on this door-to-door private guided tour of two of Cambodia’s less-visited destinations. Start with a boat trip around a floating village—Kompong Phluk between July and March, Chong Kneas during the dry season. Then travel back in time to Beng Mealea, a sprawling jungle temple with an Indiana Jones vibe. Experience the real Cambodian living in the countryside by an Army Jeep. This tour takes you on the dirt road by driving Jeep from one village to other villages until we reach the port of Kompong Phluk for a boat trip. As you will be the only tourists in the villages, the kids and locals will be waving and smiling at you because they are happy to see you visiting their villages. View the scenic landscape of green rice fields. Finally enjoy a boat trip along the river to Kompong Phluk village to see how some thousand Cambodians living on the surface of water on Tonle Sap lake. This whole tour approximately takes 4 hours.